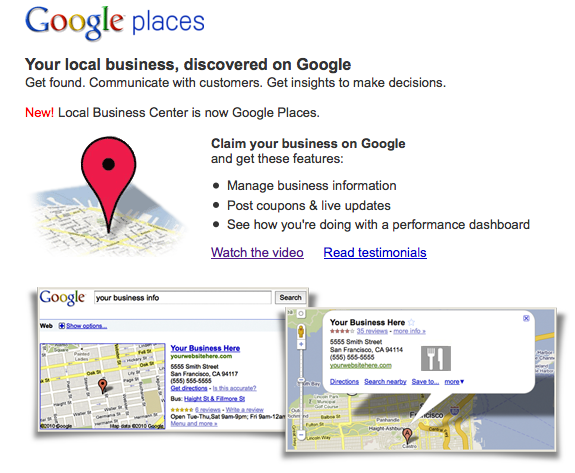 Google has renamed its Local Business Center to Google Places and added a few new features, the company announced Tuesday. But simply changing the name of a service won’t do much to attract more users. That’s why Google has also improved Place Pages to make it a bit more attractive to business owners. According to the company, users can now add service areas to their listings to inform customers on the geographic area the firm covers. Business owners can also enroll in a new advertising program for $25 per month. Upon doing so, their listings in Google’s search results will be highlighted to make them stand out from the others. Currently, the feature is available to companies in Austin, Texas; Atlanta; Houston; San Jose; and Washington. Google hopes to roll out the advertising feature to companies in San Francisco, San Diego and a few others in the coming weeks. Although Google didn’t elaborate, the company said that the improvements it has made to Places is the first step in its plan to “make Google more local.” Considering one in five searches relate to location, according to Google, that might be a good idea.